Stylish and practical, handmade, great gift for any new mom and her little boy! You can add your own gifts to this diaper cake. This cake is made of 40 Pampers Swaddlers diapers size 1-2 (8-15 lbs. ); One GUND "My First Tools" activity play set entertains and teaches (4 pc play set includes: hammer, screwdriver, wrench and tool box), One hooded Bath towel by DwellStidio, One washcloth by DwellStidio, One sleep and play by DwellStidio, One pacifier. 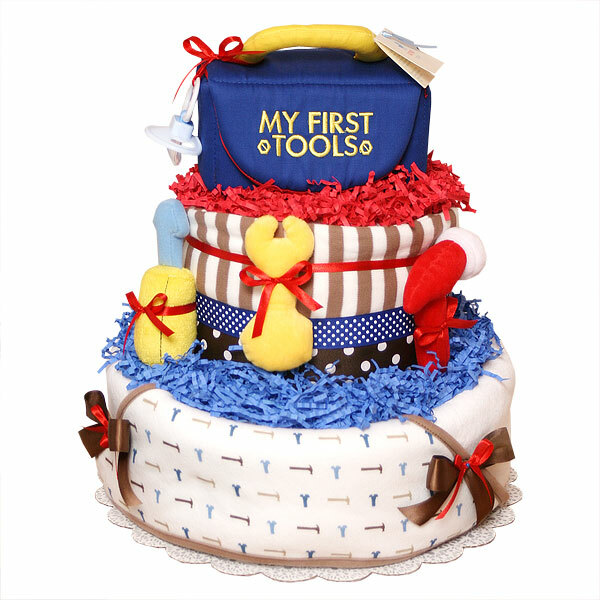 Diaper cake is wrapped with a really fun blue, red and brown ribbons and bows. Decorated with blue and red crinkle paper. This cake sits on a 12" corrugated cake board and 14" in height. Comes wrapped in cellophane with coordinating ribbons and bows. There is a cavity inside this diaper cake for your own small gifts. All our diaper cakes made of highest quality ingredients with greatest care and love. Everything included is ready to use and easy to disassemble.